Unicyclic.com is a social feed reader, which means you can subscribe to feeds and then reply to, like, or share what you're reading from the reader. If you have your own website, you can use it to log in right here using IndieAuth. If you also support Micropub, all your interactions here will be posted back to your own site. If you don't have your own website you can also create an account on this site and then log in here. 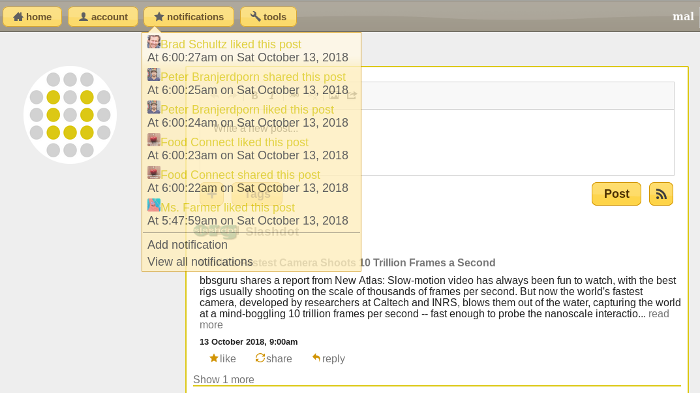 Local accounts will also receive notifications sent from other sites via webmention, including from Twitter via brid.gy. Unicyclic.com was created by Malcolm Blaney and is powered by a free software content management system called dobrado. You can also download the software from there and run it on your own server. If you need any help getting started, please use this contact form. If you're interested in following updates to the software please add my blog to your reader. Thanks for visiting!